Ecosoft Introduces share in July 2016 (and possibly later), you can purchase a reverse osmosis Filter1 c 20% discount system! Read the budget series of reverse osmosis filters Filter1 and new prices for a good and inexpensive osmosis can be in the appropriate category of our website. 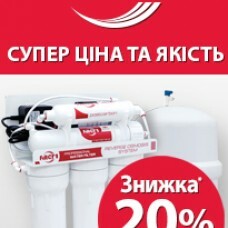 Do not miss the chance to use the favorable offer!